The majority of non-subscription genealogical pages that you encounter on the web are maintained by an individual who is interested in researching a particular person or family line. These pages usually contain information on the site maintainer’s ancestry or on particular branches of several different families rather than on a surname as a whole. That doesn’t mean valuable information isn’t present on these sites — it’s just that they have a more personal focus. You can find a wide variety of information on personal genealogical sites. Some pages list only a few surnames that the maintainer is researching; others contain extensive online genealogical databases and narratives. A site’s content depends on the amount of research, time, and computer skills the maintainer possesses. Some common items that you see on most sites include a list of surnames, an online genealogical database, pedigree and descendant charts, family photographs, research blogs, and the obligatory list of the maintainer’s favorite genealogical Internet links. Personal genealogical sites vary not only in content but also in presentation. Some sites are neatly constructed and use plain backgrounds and aesthetically pleasing colors. Other sites, however, require you to bring out your sunglasses to tone down the fluorescent colors, or they use lots of moving graphics and banner advertisements that take up valuable space and make it difficult to navigate through the site. 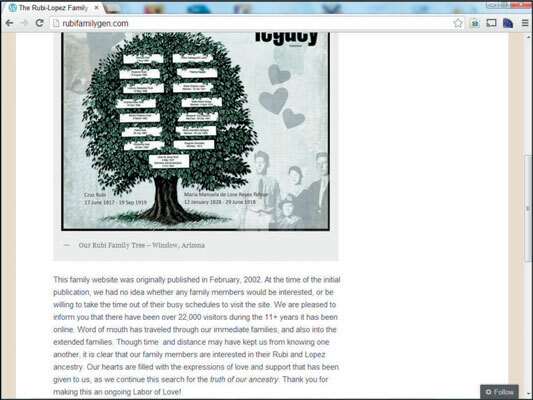 An example of a personal genealogical site is the Rubi-Lopez Genealogy Page. The Rubi-Lopez page contains articles on different lines of the family, a photo gallery, and links to other family websites. After you find a site that contains useful information, write down the maintainer’s name and e-mail address and contact him or her as soon as possible if you have any questions or want to exchange information. Personal genealogical sites have a way of disappearing without a trace because individuals frequently switch Internet service providers or stop maintaining sites.